Bling, bling, bling! Click here to play! What's that? 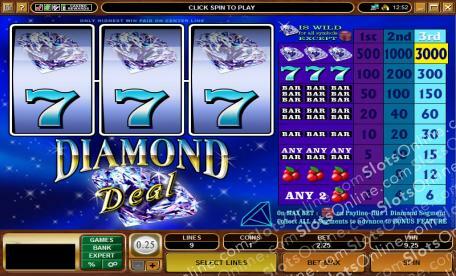 Why, it's the sound of you winning the jackpot as 3 diamonds fall into place on the Diamond Deal slots. Diamonds are forever, and the stories you could tell about winning a massive jackpot on the Diamond Deal slots could last forever as well. With a special bonus feature that awards players who keep at the game for many spins at max bet, the Diamond Deal slots provide an exciting twist. Mostly, however, these slots are entirely straightforward, only allowing 1 coin value, using a single payline, and using simple BAR symbols, cherries and lucky 7s in addition to the jackpot diamonds. Anyone who would like to make a fortune from diamonds - but not in the usual way - should take a whirl on the Diamond Deal slots. The Diamond symbol is wild and substitutes for any symbol other than the Jewelry Box bonus symbol. The bonus is triggered when 4 Jewelry Box symbols have awarded diamond pieces when the max bet is played. In the bonus, the player chooses a Jewelry Box and is given a combination that awards a bonus prize value. This bonus feature is triggered over time, as Jewelry Box symbols will generally land on the reels very irregularly. Autoplay can be set for up to 500 spins. It may also be set to stop when a jackpot is won, a bonus is triggered, on any win, on a win of a certain amount, or if credits increase of decrease by a certain amount.